A gifted and exuberant artist Halyna Novakiwsky is one of the most popular artists of Ukrainian heritage working in Toronto. Born in Peremyshl in 1923, was raised in Cracow and graduated from the Cracow Academy of Art (1939-1943) which during the German occupation was renamed the Cracow Institute of Plastic Arts. She specialized in theatre set design and worked as a set designer for the Theatre of Small Forms in Lviv and as the head designer at the Ukrainian Theatre in Stanyslaviv (now Ivano-Frankivske). 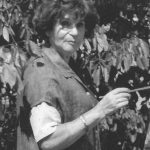 With the advance of the Soviet Red Army Halyna Novakiwsky fled westward where she continued her art studies in Vienna and Munich. In 1949 she emigrated to Canada together with her husband and infant son. The family settled in Toronto, where despite the hardships of immigration and raising a family, she found time to paint. Halyna Novakiwsky’s artistic vision developed and matured in Canada. Her first solo exhibition was held in Toronto at the W&W Gallery in 1962. It was followed by an exhibition at the University of Western Ontario in London (1963) and Scarborough Public Library (1971). Other solo exhibits were held in Toronto (1964, 1967, 1977, 1980, 1990), in Chicago (1976, 1981), Ottawa (1977), Warren, Michigan (1978), and Edmonton (1979). In 1995 she was invited to exhibit at the prestigious State Museum of Ukrainian Visual Arts in Kyiv and the Lviv Art Gallery in Ukraine. In addition to the twenty solo exhibitions, Halyna Novakiwsky participated in numerous group exhibits in Canada, the United States of America, and since 1988 in Ukraine. She has been an active member of the Ukrainian Association of Visual Artists of Canada, the Society of Canadian Artists, and the Colour and Form Society. One of her pictures received Honourable Mention in 1982 in the Best Oil Painting category at the Cosmopolitan Club Exhibition at the O’Keefe Centre in Toronto. In 1999 her pastel Precious Moment won an award at the Pastel Society of Ontario Exhibition. Throughout the years Halyna Novakiwsky has painted very inventively and has experimented with contemporary trends in art albeit within the boundaries of representational art. Although her images are recognizable, the emphasis is not on imitating nature, but on rendering the immediate sensation of colour and form. Stylistically her sources range from Impressionism and Post-Impressionism to Expressionism, Cubism, and American Abstract Expressionism. In particular, her paintings demonstrate an understanding of Post-Impressionist colour and structure. However, her sensibility as a creative artist has been enriched not only by her knowledge of modern art movements, but also by her Ukrainian heritage and Canadian experiences. Halyna Novakiwsky finds the subject matter for her paintings in her immediate surroundings which she renders with affection and sensitivity, as may be seen in the domestic objects of her still life compositions, the beautiful bouquets of flowers from her garden, in the glimpses of mundane urban sights or portrayals of young family members. Her genre scenes include people going about their daily tasks, conversing, walking in the sunshine, rain or snow. The changing seasons of her landscapes and close-up views of such unspectacular subjects as a patch of dry grass, dandelions, dried sunflowers or thistles are transformed into painterly compositions evocative of life cycles. On occasion the artist reaches into the past, usually into history associated with Ukrainians, as in Page of Canadian History where the content is more anecdotal and the images are symbolic of Ukrainian pioneer settlements in Canada. Novakiwsky’s work also embraces such universal themes as mother and child, both secular and sacred, as in Precious Moment. Landscapes, cityscapes, genre scenes, still life, figural compositions, and portraits, as well as focused views of nature abound with rich textural surfaces, fluid outlines, and sophisticated colour patterns with multiple overlays of several hues. Pictorial space is constructed through colour, contrasts of light and dark, texture, and overlapping rather than through linear or aerial perspective. The rhythms created by the agile brushstrokes emphasize the shallow, condensed space as in Rainy Day. The anonymous figures of pedestrians huddled against the rain and painted with gestural, modulated gray hues provide an effective element of design. The muted glow of reflected light and shadow rendered with a myriad of tonal variations of a vibrant palette and a pulsating, expressive brushstroke, which dominate Halyna Novakiwsky’s oil paintings, create a characteristic, distinctive style indicative of an accomplished, mature artist with a lyrical vision.